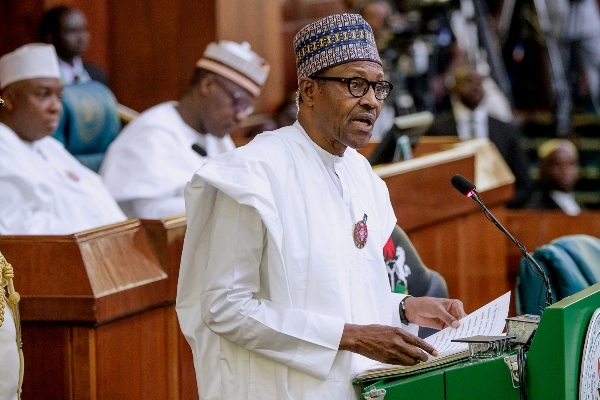 Nigerian President Muhammadu Buhari on Wednesday in Abuja presented N8.83 trillion (about $28.852 billion) budget for 2019 to the joint session of the country’s National Assembly. The report by Nigeria’s Channels Television said that the presentation of the budget was done under a rowdy atmosphere with the opposition lawmakers repeatedly booing the President as he listed his achievements. The report added that the lawmakers repeatedly interrupted President Buhari’s speech with chants and boos. “As the President mentioned achievements of his administration, the aggrieved lawmakers responded with chants of Liess! Nooo! Barawo! Grasscuter! However, the President’s response and composure was met with applaud by other lawmakers. The highlights of the budget proposal showed that it was based on the oil price of $60 per barrel and oil production of 2.3 million barrels per day. The exchange rate of the local currency is based on N305 to $1, while the Gross Domestic Product growth is pegged at 3.01 percent while the inflation rate is put 9.98 percent. The budget breakdown of the budget shows that N4.04 trillion was allocated to recurrent, while capital expenditure is allocated N2.031 trillion. The provision for debt service was N2.14 trillion with Statutory transfer put at N492.36 billion and Sinking fund was allocated N120 billion. The lawmakers are expected to review the budget before it is assented into law by the president.